Back in November, Cascade Alliance had the opportunity to hear Chris Pletcher, the Deputy Director from Finger Lakes Reuse, share how he tracks data to determine how many staff hours are needed to raise revenue. 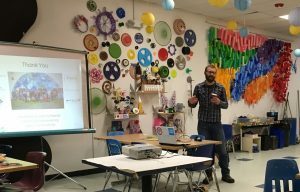 We were so impressed with his system we invited him to come share his presentation with the Scrap Exchange in Durham, NC. the following month. We love seeing our members collaborate and teaching one another as they all have such unique procedures and it’s a great opportunity for us all to learn. Chris will be in Eugene for our upcoming Cascade Alliance Convening next week where he will share his presentation with all of the Cascade Alliance members. We are thankful to provide the platform to widen his reach as data tracking is so important. For some background context, you can read more about the collaboration by clicking here. We look forward to seeing our members in Eugene next week! Stay tuned for upcoming blog posts to hear about our sponsors and updates from the conference.